I have been in the presence of the wondrous Anne Schwanewilms. Now, for those (less fortunate creatures, may your lives be one day more complete) who have not had such good fortune, there's little I can say to approximate the experience. And to those who are equally blessed, there's little I can add because you already have the Knowledge. It happened like this. When the trip was in the planing stages, dots on a calender, expanding and contracting, moving around the map, some points fixed and others moveable, there came from David Nice, a kindred blogger whose encyclopaedic knowledge and depths of insights would be otherwise completely intimidating bar for his generosity of spirit and tolerance, verily enthusiasm, for learners (but then aren't we all only somewhere on the ladder) and otherwise lesser musical creatures, an invitation to meet in Dresden on the occasion of a dream cast Der Rosenkavalier. It was little surprise to find out the performance was sold out, and while tickets come and go, appear and disappear, the nature of the planning and the nature of me were such that something more concrete than 'she'll be right' was in order, and off went a letter to the box office. No sooner sent than came the reply with the offer of two perfect (and I mean perfect) seats. The gods had spoken. The fulcrum of the whole journey changed. And so on the day there were four (two Londoners, two Sydneysiders) in the car on the autobahn from Berlin to Dresden, its flood waters receding, a calmness in its wide open spaces and haunted stones, a city so easy to slip into and feel comfortable and safe, and want to stay. ... itself not soiled by the flooded Elbe, although the sets for this Rosenkavalier were either unable to be transported, or somewhat water damaged, or some combination of both. We would see a downstage performance in front on a suitably simple backdrop of constrained elegance, warmed by the loveliest of sets of wall candelabra, and with three pairs of double doors for the comings and goings of households and inns. Little was lost with this scaling down, except perhaps the presentation of the rose although what gorgeousness was pouring out from the pit was more than enough to compensate and deliver that all too rare hearing-is-seeing phenomenon. And while this was my second visit to Semperoper (happy to die twice now), it was the first for opera, and while I don't doubt for a second that the acoustics are all they are said to be, we might just have scored a perfectly placed sound board which shifted what we were hearing even further along the good-better-best line. Perfect seats. Perfect sound. 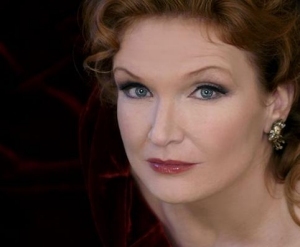 The Semper orchestra playing perfectly the music of their genes with Christian Thielemann directing from his heart and not his head, and Anne Schwanewilms in bed with Elina Garanca. That should just about be all you need to know. But there is more, much more, and it's the reality of these voices for which I have no adequate description. Anne Schwanewilms, it needs to be said at the outset, is an absolutely compelling stage presence. She's not especially tall, but looks to be, is svelte with the loveliest of arms and hands, and has that carriage of head which oozes confident charm without ever slipping into arrogance. And all this in a black fine shoulder strapped night gown most Marschallins only dreamt about in their better days, let alone embraced in their latter ones; a Marschallin who was as comfortably a woman of her years in her circumstances as any could be, without ever resorting to the stuffy haute histrionics some need to make their case. And from this radiant creature comes a voice of glowing purity with perfect diction, impeccable placement and phrasing, and the most beautiful of shading of colours and dynamics. Did I say the voice glows? It glows - like a light, from within. She sings to you, and only you, she speaks to you, and only you, and whispers secrets in your ear. 'Du bist mein Bub, du bist mein Scahtz'. Of Elina Garanca, what can be said? The perfect Octavian? The looks, the demeanor, the feel for youth's overreached desires and misplaced understandings were perfectly in place. The voice is luxury itself, huge and if on occasions she pushed it (though push is really the wrong word, maybe less contained) further than was expected, or necessary, it was never at the expense of beauty of tone or spreading, but rather only served to underline this exuberant excited fresh young masculinity she managed to capture so easily, and which was impeccably harnessed as the night, and she/he, matured. If Baron Ochs be the real central character of this humorous yet poignant work, then I have just seen the wonderful bass Peter Rose give it the perfect delivery. Neither country bumpkin nor dirty old lech, Peter Rose's Ochs is a lovable fellow and quietly endearing, content with his lot in his own bewildered way, and a personality sneaking up on you till you realise that you feel more for him than you might care to admit. Daniella Fally's early anxious nervous Sophie may have been somewhat overshadowed by the brilliance of her colleagues, but the tightness loosened as the night progressed and by the final trio, she was a fine descant floating lovely clean sliver across the lights. The smaller character parts were all fine in their own way, and especially noteworthy was the cheeky Annina of Helene (one 'n') Schneiderman. What a giggle she is. And finally the handkerchief was retrieved, mine and hers, and there she was, one last time. Thank you so, so much for offering a glimpse (well, more than that!) of what had to be an extraordinary experience. Such an idyllic time you have had. I so wish we could have been there too, but, at least, I do have my tickets in hand for Die Frau Ohne Schatten, in which Schwanewilms shall be the Empress. Ja, ja. AND you have captured David absolutely spot on with this: "there came from David Nice, a kindred blogger whose encyclopaedic knowledge and depths of insights would be otherwise completely intimidating bar for his generosity of spirit and tolerance, verily enthusiasm, for learners . . ." Ja, ja (once again). An update, at last! The Semperoper remains, I think, my favourite house, and Dresden one of my favourite places. Envy, down, Sir! Down! Down! No tolerance needed. Look at this. You've captured the essence of heavenly Anne better than I could (did). And my take was maybe too swamped in reservations which shouldn't have detracted from the essential glories of the evening. What can never be forgotten is how we came out into the balm of the Dresden evening and the breathtaking view over Operaplatz to the Hofkirche after the Act 1 transcendence. Privileged to have shared it with you. Susan, if it could have been anything better than it was then it would only have been by your being there. And David's floral skills are wonderfully free range, with an unselfconscious clustering of colours, shades, shapes and perfumes, and at once one felt at home - flowers from the garden on the table take me home. M, it is completely unique isn't it, Dresden, where the pleasure of going again never diminishes. The calmness and balance and beauty was in such contrast to Berlin, this time. David, there's much not to be forgotten! Thought of you today, wanderer, and the post about the Kiwis. We haven't caught up, but today we made a pretty darn good step: here The question was what music to post. I kept thinking of those Kiwis, then remembered Shara Worden's song with the "hallelujah" lines. It seemed a good fit.